Best Fat Burning Workouts at home! Full body effective fat burning exercise at home for women, practice Simple women workouts to burn belly fat in 30 days. 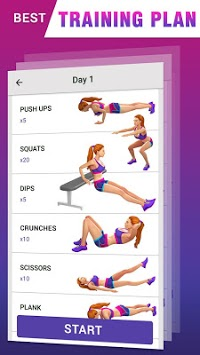 Fat loss exercise for women blast the body fat and burn calories turn it into muscle in 30 days, this women's fitness workout app designed to help you lose fat, include list of fat burning workouts for women and fat burning exercises to reduce belly fat, lose weight for women. Fat burning exercise for female and male helps women to tone your full body and lean muscle. Hiit workouts for women burns calories and blast fat with this intense workout which are known for easy to practice, flatten your tummy with our easy and effective fat burning exercise at home. Best Workout Moves to Loss Fat! When it comes to fat loss these belly fat exercises are a perfect way to lose fat, this Core workout for men routine designed to burn belly fat, lose the full body fat slow and steady with this Great exercise for your legs and arms. Daily workout at home for all your main muscle groups! Avoid the crowds at the gym – fat burning workouts You Can Do At Home. Whatever the reason just have to spend 10 minutes a day for the basic home workout today. Nothing burns belly fat faster! 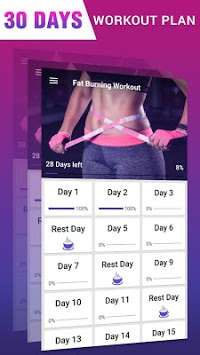 The number one stomach fat burning app lose your gut. Work as many muscles as possible twist Crunches, burn away your stomach fat in 30 days. Maximize fat burning! Fat burning exercises app that covers up your abs within 10 exercises. This 10 minutes exercise routine helps you lose stomach fat and get amazing abs, Start doing these Quick and effective fat burning workouts which act as killer of fat in the belly. •	Lose fat belly in 30 days.